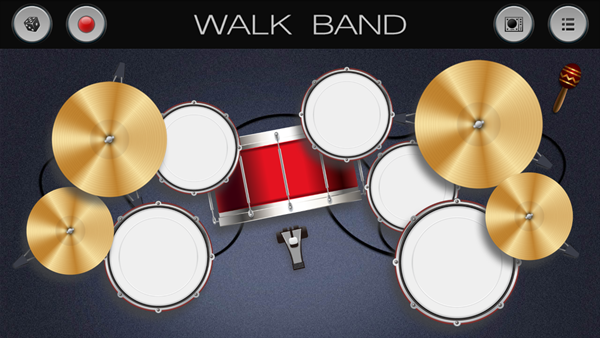 Walkband is an Android application developed by Revontulet Soft Inc consisting of a set of virtual musical instruments that are needed for a real band. 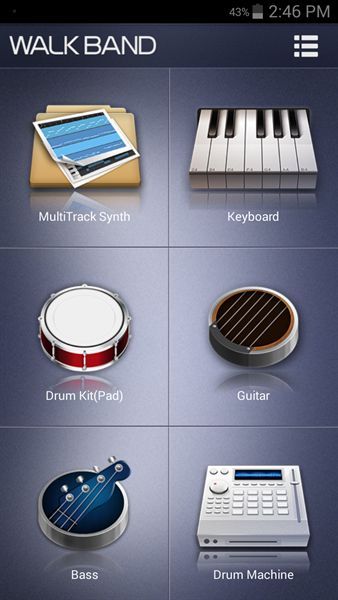 The instruments included in this application are Keyboard, Guitar, Drum Kit, Drum Machine and Bass Guitar. There is also a multi-track synthesizer. These instruments sound good and can be used in times when the band members are not with you and you want to arrange some song. This application can also be pretty handy for a person eager to learn and get their hands on an instrument. This will give them the opportunity to get to know how the instrument works. I will describe all the instruments in detail in this article. First of all, let's get to know about the interface of the application. 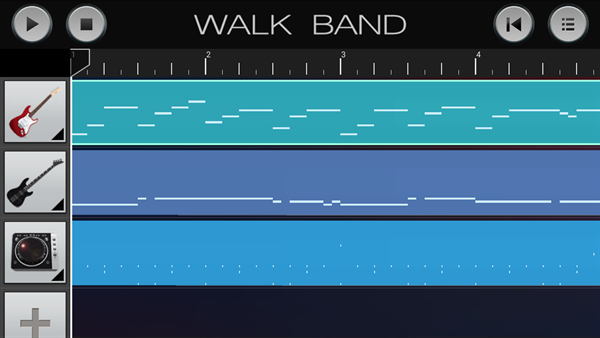 When you open Walkband you are presented with a screen that lists all the instruments in the application as buttons along with a button called Records to access your previous records. You have to touch one of the buttons to get into the instrument. After you touch one of the buttons the instrument gets displayed on the screen and you can start playing right away. On the instrument screen, there are options to change the settings of the instrument which can completely change the sound of the instrument. So, now we will take a look at the instruments in the application. When you touch the Keyboard button on the start screen of the application you are taken to the Keyboard screen. Here you can start playing the Piano by touching the keys. There are many different options that allow the user to customize the piano to their needs. There is a piano-shaped button to change the sound on the top bar. With this button, you can change the sound of the instrument from Acoustic Piano to Bright Piano, MusicBox, Organ, Synth or Rhodes. You can also download additional instruments like String Ensemble, Violin, Sitar, Flute and more by selecting the + button. On the left side of the bar, you have a button to change the view of the Piano. There are 4 modes in it: Chords Mode, Single Row Mode, Dual Row Mode, and Two Player Mode. 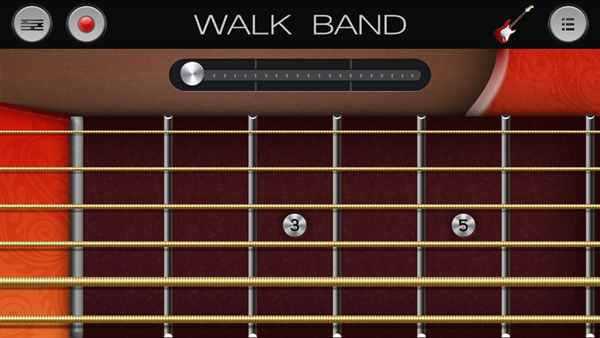 Chords Mode: When you select this mode 8 buttons are shown each showing a different chord. Now you can touch on the arrow and you can now change the chords to the ones you want. Just select a button and choose the chord from the upper part of the screen. You can also touch on the Piano button on the left to show Piano on the top half part of the screen. Single Row Mode: This mode is the basic Piano that shows the keys of the Piano. There are many options in this mode. You can set the number of keys shown on the screen by changing the value of Visible Keys in the options. You can also control the Metronome and Sustain. If you go to the Settings option you can do different customizations like changing the tempo of the metronome, setting its time signature between 3/4, 4/4 and 6/8 which are the most common time signatures. You can also choose to show the key labels like C3, D4 on the keys, so that you know in which octave you currently are on. This can also be pretty handy for beginners who are learning the notes. Dual Row Mode: In this mode you are presented with two pianos, you can set the octave differently for each. You can also enable Keyboard Lock to keep from accidentally changing the octave while playing. This can be pretty useful at times. When you open the guitar virtual instrument you are presented with the strings of guitar in which you can touch on the appropriate string on the correct fret and get going. There are various settings as well where you can change the way the instrument works. 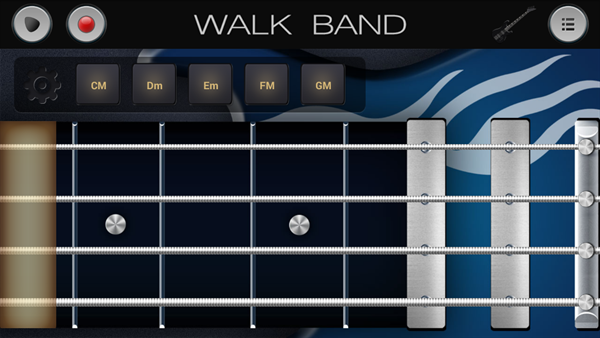 There is a slider above which lets you access different frets on the guitar. When you play on a string you can just move your finger up and down on the string to give it a modulation effect. If you touch the button on the top left of the screen you can switch between the Chords and Solo view. When you get into the Chords view you can add your own chords to the stack and just select a chord and play the strings. It will play the correct chord even if you play on different frets. There is a guitar-shaped button on the bar which lets you choose between different models of guitars. There are Steel, Nylon, Clean and Overdrive guitars. You can also get more guitars online by selecting the More button. You can also turn on and off the metronome and the solo pitch bend. It is a great tool for guitarists. When you select the Bass Guitar button you will be presented with the strings of the bass guitar. Almost all the settings of the bass guitar are the same as the guitar. There is a wide range of variations of chords to choose from. You can also choose from different models of bass guitars from Acoustic, Picked, Slap and Fingered Bass. When you select the Drum Kit button you get a set of 12 buttons on the screen which all have different drum sounds. This is more like a Rhythm Pad. You can start playing the beat you want. You also have the option of changing the drum kit. The drum kits present are Jazz, Dance, Hiphop, Percussion, Rock and more can be found online. You can also turn off the Pad mode which shows drum set on the screen which you can use to play. There's also a dice button which will play any random beat. One of the great things about this tool is that you can choose a beats pattern from a list of Blues, Jazz and many more styles and touch the Play button to hear that. It is a great fun to play this Drum Kit. 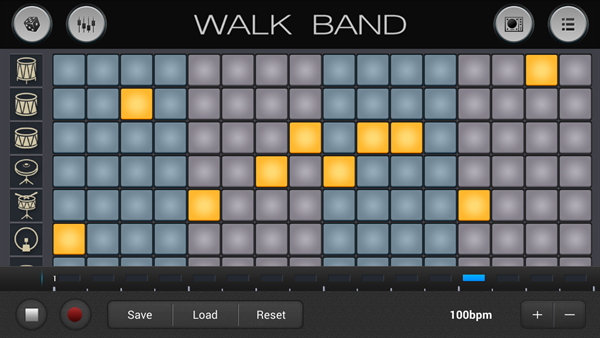 Drum machine is a programmer for drums. You can create drum patterns and it plays as a loop. Here you have the option of changing the tempo, saving and loading previously saved data, adjusting the volume of different parts and more. You can also choose from different drum kits. Dice option is available here as well. Multitrack Synthesizer is a tool where you can create music with different tools described above and mix all of them to a single audio file. You can hear the music created so far and play along with it and record it. There are many different options available for each track like Quantization (line up the notes in the music to the correct beat), Transposition (lower or upper the scale of the music), Track Volume, Change Instrument. There is also an option to edit your recorded music. Here you can edit each note in the music individually. It is advisable to turn on the metronome for knowing the tempo of the music. 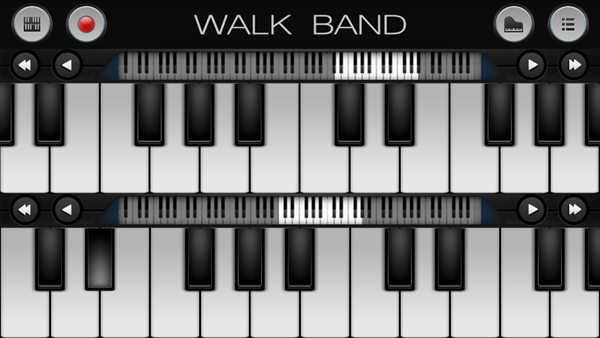 In my opinion, Walkband is a complete application that any musician using an Android smartphone must have. It has a rating of 4.3 on the Play store as of now and works with Android smartphones from versions 3.1 and above. It has all the basic instruments needed to get going with some quick music. The recorder is a really cool thing where you can record each part and then hear how it sounds when mixed. This can be done when you are not in front of your instruments like when you are traveling. This application can be pretty handy for you if your are a serious musician. So, what are you waiting for? Just go ahead and install the application from the Android Play store.